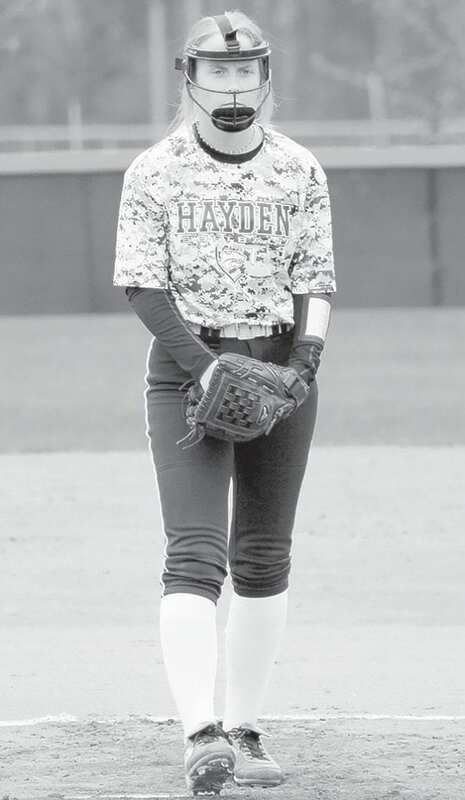 Hayden pitcher Hannah Cox allowed zero hits, struck out four, and walked zero during the Lady Wildcats’ county tournament 16-0 victory over J.B. Pennington. Hayden continued to prove their number one ranking in class 5A in the county tournament last week. They allowed just three runs in four games and scored 47 total runs. Simply put, the Lady Wildcats are unstoppable and demolish any team in their path. They defeated Susan Moore 12-1 in their first game. The first inning was a slow start for Hayden, with a tied 1-1 score. However, Gracie Benton’s three run homer, as well as five additional runs, secured their victory in the second inning. Lindsey Smith drove the ball over the fence to score two runs and Olivia Armstrong doubled and brought in Kaitlyn Belding to end the third inning 12-1. They collected 15 total hits. Savannah Woodard (3-4), Belding (2-2, 2 RBI), Isabelle Johnson (2-3, 3 RBI), Lindsey Smith (2-3, 2 RBI), and Hannah Cox (2-3) had multiple hits to lead the Wildcats. The second day for Hayden looked much like the first, two blowouts. They defeated J.B. Pennington 9-2 and shutout Appalachian 10-0. The Lady Tigers led 1-0 in the first inning, but the second inning was too much for Pennington. Hayden scored four runs and gave up zero. Cox pitched the Wildcats to their first victory of the day. She surrendered four hits and two runs, struck out four, and walked one during her four innings pitched. The Wildcats had 10 total hits. Woodard and Belding led Hayden from the plate with two hits each. Becca Benton hit the only home run in the game. Savannah Painter led her team to victory after pitching a shutout against Appalachian. She surrendered just one hit, struck out two, and walked one in her five innings. Hayden scored two runs in the first, one in the fourth, and seven in the sixth. Smith was blazing from the plate (2-4, 4 RBIs); she hit a homer in the first and sixth innings. The Lady Wildcats collected 13 total hits in the game. Taylor Yeagar, Smith, Benton, and Belding each had two hits to lead Hayden in their 10-0 win. Three wins took them to the championship game in another matchup against Pennington. Once again, the Lady Tigers were no contest in this catfight. Hayden scored one run in the first inning and gained momentum in the second after scoring four runs. They scored another two in the third, but nothing compared to the nine runs scored in the fourth. It began with Woodard, who was first up to the plate, hitting a homer to center field. The score fest continued and Johnson and Benton also hit homeruns. Woodard came back up to bat and homered yet again at the end of the fourth and the game ended 16-0. The Lady Wildcats had 10 total hits. Johnson led from the plate (3-3, 3 RBIs). Cox was the winning pitcher allowing zero hits, striking out four, and walking zero in her three innings pitched. Painter came out of the bullpen for one inning to close the game. The tournament wins improved Hayden’s record to 23-4. The Wildcats hope to continue their winning streak when they host Dora (2-25) Thursday.